Photography has become such an intrinsic part of everybody’s lives that it has become difficult to imagine what the world would have been like without it. From the regular consumer uses (holiday snaps family portraits) to journalism’s increasing reliance on the image, photography has had an enormous cultural impact. Its progress towards this point has been swift, but it had humble beginnings. The first photograph was taken by Nicéphore Niepce in 1820s, when the inventor used an eight-hour exposure to capture an image onto a pewter plate. The plate was covered in a substance similar to bitumen. Considerable developments were made over the course of the next 40 years, when Niepce began a working partnership with Louis Daguerre. Niepce died in 1833, but Daguerre inherited his notes. With the help of these, the Parisian scientist perfected Niepce’s technique of using silver plates coated in a chalk mixture. In 1839 the Daguerrotype plate was launched, which was exposed to iodine before exposure to light, and subsequently coated in mercury fumes. The plate was then bathed in order to fix it. In this way, Daguerre had begun to develop film processing. Soon after this Daguerre heard of the work of Hercules Florence, who had invented a similar process and named it ‘photographie’. Using a combination of the two techniques, the Parisian spent the rest of his days producing a system which would be fast enough to take images of people. In 1838 Daguerre made “Boulevard du Temple”, which was the first ever photograph to contain a person. As with many other great inventions, the Industrial Revolution guaranteed the adoption of photography by the masses. There was a great fashion for portraits amongst the middle classes at this time, and the cost and time efficiency of photography meant that it could rival oil paintings. It was not until 1884, however, that the first truly general use camera was marketed, when George Eastman launched the Kodak camera. This removed the need for the photographer to carry around plates and chemicals, miniaturising the process and replacing plates with film. 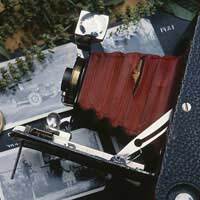 In 1901 the Kodak Brownie became the first mass-produced camera. Colour photography was also pioneered during the mid-1800s, but no scientist could work out how to fix the photograph to any medium. In 1861, however, this problem was cracked and the first permanent colour photograph was taken. Generally, colour photographs were taken with three cameras. Each camera would capture red, green, or blue light, and their exposures would be developed together in order to achieve the full spectrum. It took longer to work out how to replace colour plates with film, but this was eventually achieved in 1907 when two French scientists made a successful filter from dye and potato starch. Today, of course, cameras continue to be miniaturised. However, perhaps the most important development has been the advent of digital. This process has revolutionised photography in the 20th Century, entirely doing away with the need for film. For more information on digital, have a look at some of the other articles on this site.